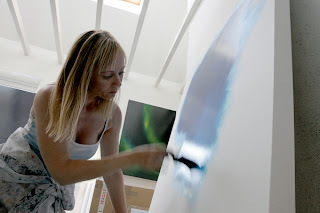 Internationally acclaimed artist Kathryn Thomas, who recently relocated from Bristol to Poole, will be opening up her studio to the public from Saturday 29th October to Sunday 13th November for her latest exhibition, ‘Skylights 2011’. The display, which offers 45 original oil paintings not previously displayed in Poole, is open every day throughout the exhibition dates from 10am to 8pm on weekdays and 10am to 6pm at weekends and is situated at West Quay House on West Quay Road in Poole. Admission is free and Kathryn will be available to answer questions or talk about her inspiration and techniques. The arrangement of Kathryn’s Studio allows the public the uncommon opportunity to view art both in a working environment and also in a gallery space for the presentation of the finished article. The experience is further enhanced by the accompaniment of specially commissioned music by the sound recordist, Simon Whetham. The venue is especially poignant, as the building may be demolished in a few months’ time to make way for flats as part of the Holes Bay redevelopment project. Numerous people have already been side-tracked from their visit to the viewing platform of the new lifting bridge into the Studio for an altogether different type of viewing! Throughout her career, Kathryn has found inspiration in nature. It is evident from her paintings that she is fascinated by natural light, how it changes with the weather and in turn, how those changes affect the landscapes we see and the way we see them. Unsurprising then that she should have found Poole to be so attractive with its strong and ever changing horizon. In more recent years her artistic vision has journeyed beyond the horizon and into space. Aided by an award from the prestigious Pollock Krasner Foundation of New York, Kathryn researched the aurora borealis, the galaxies and the planets and subsequently applied a quite different style to her paintings which, nevertheless, retain the vibrancy and evocative feel of her more traditional work.